But then, once the day is is saved-- or at least immediate danger quelled-- there's got to be some wind down. How much is too much, that's the question. My instinct is to at least have some sort of check-in with the key plot points or character threads. 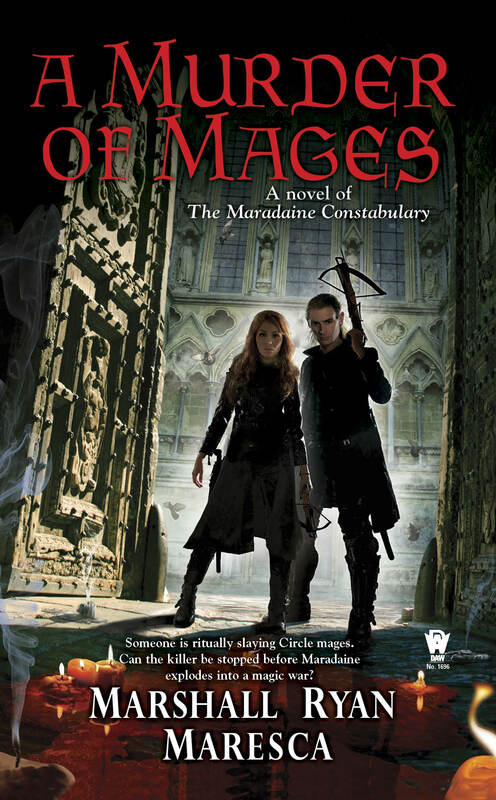 If it's a story with strong POV rules (for example, in A Murder of Mages we only get POVs from Minox and Satrine), then it's a good idea to have than final reflection or check-in with those POVs. The big rule for me is making sure nothing is left ambiguous that shouldn't be ambiguous. For example, if a minor character was hurt in the big finale, you should make it clear that either A. they're going to be all right or B. they aren't, and what the consequences might be. Rowling liked to have a pattern for her denouement in the Harry Potter books-- or at least the first five-- which was essentially Dumbledore Explains It All For You. After everything is done, one way or another Harry has a sit-down with Dumbledore in which the old wizard lays out what the heck actually happened and clarifies any plot holes there might have been. After that, it's more or less Harry packs up and takes the train home. 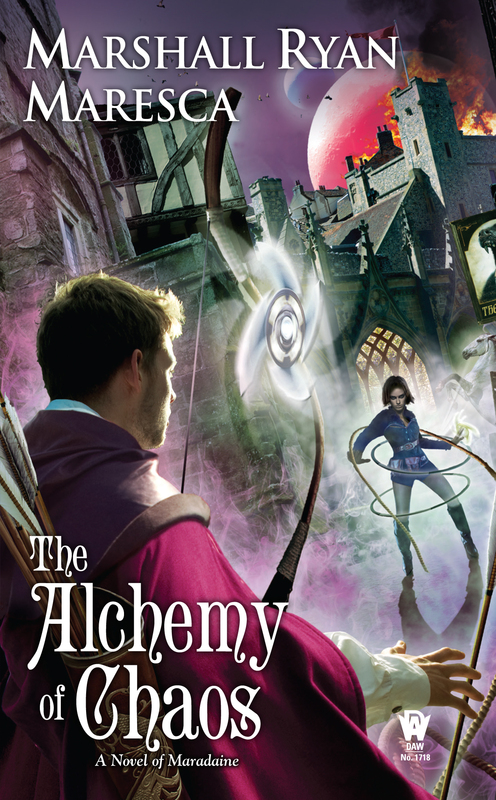 My various series don't have quite the same structure-- and in the Thorn books, Prof. Alimen doesn't quite fulfill the same role-- though in both Thorn of Dentonhill and The Alchemy of Chaos, a good portion of the denouement is centered around a Veranix/Alimen scene. I'll confess, the denouement for The Imposters of Aventil was extremely challenging. That book, frankly, has a lot of balls in the air, so making sure each of those balls doesn't drop on the floor before the book is done was crucial-- especially doing it in such a way that it didn't feel like I was just dragging my heels to get to the end. That said, I won't give anything away, save this: the denouement does not maintain the pattern. And that's fine. We need to mix things up to keep the work fresh. Speaking of, this draft won't write itself. Off to the word mines. *- It depends on the type of story, but sometimes "not losing" is as much of a victory as your heroes are going to get. A question I get asked a lot is, with three different series (and a fourth or more in the works), how do I possibly keep everything straight. And the answer is: spreadsheets. Now, I've had to make this thing low-res enough that you can't really read what's on it, because it would be OH DEAR LORD THE SPOILERS otherwise. I'm probably giving too much game away just with letting you all see this. But I wanted to give you a sense of the scope. There are a lot of moving parts, and sometimes you just have to stop and take a look at all the big picture stuff to get a sense. Especially right now. 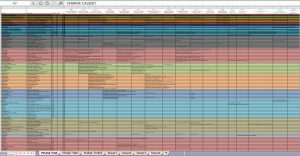 I won't say that A Parliament of Bodies is the most ambitious novel in the Maradaine verse to date-- but it is one where I've had to repeatedly re-assess the outline based on events in all the other books I've written since first writing the outline. But that's why I have the big picture, so I can get that sense of how it all needs to look, where it's going, and where the story has already been. Friends, I won't lie to you: I love writing, I love that this is my life, but there are times when it's a grind. There are plenty of times where the idea of going into a manuscript just makes me want to go lie down. 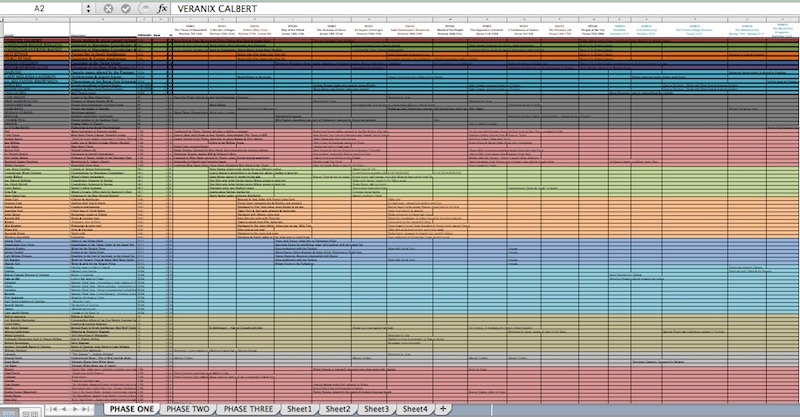 Right now, I've had to put drafting A Parliament of Bodies to the side for a couple weeks. Largely to focus on Holver Alley promotion, Imposters of Aventil copyedits and a whole lot of home/business/Live the Language stuff that required the forefront of my attention. Now it's time to get back into Parliament. And getting back into a book once you've been out of it for a chunk of time can be a real grind. If the engine is cold, it takes a bit to get back up to full speed. Part of the process, for me, involves printing out what I've got and reading through with a red pen. It helps get me back in the mindset, and see where I might be starting to lose the plot or go off course. This part isn't always "fun", though, so it helps to have a couple other things to mix it up and keep it fresh. A big thing I do to help this is engage in a secondary project for a bit, to be a palate cleanser. I'll also do long-term planning, big picture work. And all this is why, this week, I've been making hand-edits on the first part of Parliament, working a bit on The Secret Project, and updating all the Maradaine spreadsheets. And doing that stuff is, frankly, a lot of fun for me. Especially after a couple weeks of household bookkeeping data entry. Oh, taxes, such a joy. But that work is done, at least. How about you? How's your journey in the word mines this week? Summer and the Grand Tournament of High Colleges have come to the University of Maradaine. If the heat and the crowds weren't enough to bring the campus and the neighborhood of Aventil to a boiling point, rumors that The Thorn is on the warpath—killing the last of the Red Rabbits—is enough to tip all of Maradaine into the fire. Except Veranix Calbert, magic student at the University, is The Thorn, and he's not the one viciously hunting the Red Rabbits. Veranix has his hands full with his share of responsibilities for the Tournament, and as The Thorn he’s been trying to find the source of the mind-destroying effitte being sold on campus. He’s as confused as anyone about the rumors. When The Thorn imposter publicly attacks the local Aventil constables, the Constabulary bring in their own special investigators: Inspectors Minox Welling and Satrine Rainey from the Maradaine Grand Inspectors Unit. Can Veranix find out who the imposter is and stop him before Welling and Rainey arrest him for the imposter’s crimes? Available for Pre-order at Amazon, Barnes & Noble, and more! Books are out, Drinks all around! I've got a lot on my plate this week, including: I just appeared on Writing on the Air (The March 15th episode). And sometimes when you're busy, you need to just stop and have a cocktail. And if you stop by here, you can get the cocktail of the house. My wife sometimes calls it the Maresca Mule, though I think Mexican Mule is the better term. How do you make the Mexican Mule? Glad you asked! Take a cocktail glass, and run a lime along the rim, and then salt the rim with Chilito. Add crushed ice, a shot of tequila, juice of half a lime, and then top it off with ginger brew. It's spicy, strong and delicious. 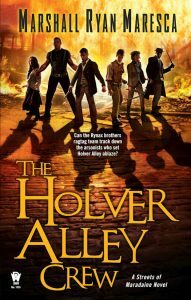 So, THE HOLVER ALLEY CREW is out in the world. So far the initial response has been excellent, and I'm thrilled that people are falling in love with the Rynax brothers and the rest of the crew. Also, on Wednesday, I'll be appearing on Writing On The Air. You can listen live at 6pm Central Time, or after they put up the podcast version. If you haven't noticed, I've got a pretty intense writing schedule. The Holver Alley Crew just came out, and The Imposters of Aventil is out in the fall (Pre-order now! ), and Lady Henterman's Wardrobe next year, and... you get the picture. I don't have a too much wiggle room in there. But that doesn't mean I don't have days where I'm all, "Yeah.... writing. Need to ... words... or something." I definitely have days where I I whiff it. ESPECIALLY right now, when a book has just come out, and all my brain power is used by "BOOK! OUT! ARE PEOPLE BUYING IT? ARE THEY LIKING IT? WHAT IS HAPPENING?" This is my fifth book, and it's still pretty much like the first one. I've curbed some of the less-healthy behaviors (refreshing Amazon ranking constantly), but it still is occupying a heck of a lot of brain space. My head is a spinning rainbow wheel. 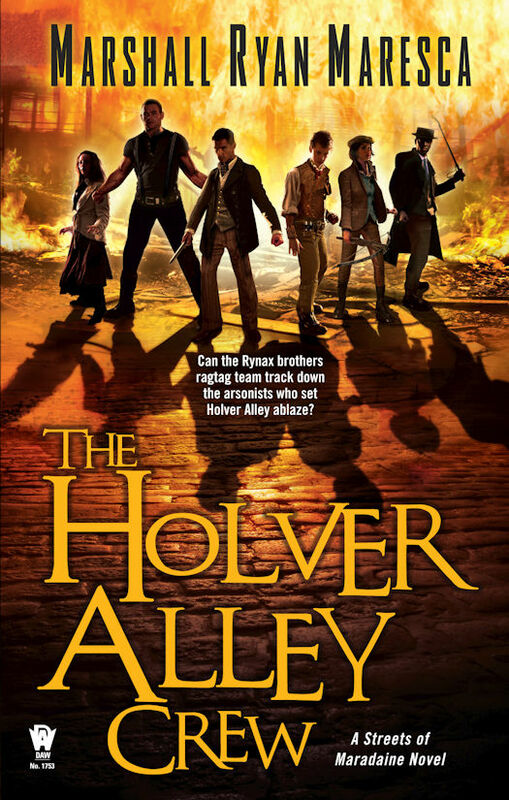 But right now, I'm in that happy-distracted place about the release of The Holver Alley Crew. Have you picked it up yet? Then GET ON IT. Meanwhile, I'm going to get on the writing. Soon. Any minute now. 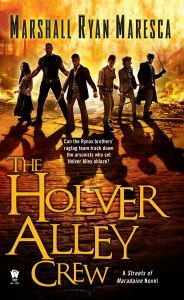 This week is the release of THE HOLVER ALLEY CREW! That means we've got reviews and guest blogs all over the place, and it is time to get that pre-order in while you still can. (Because after tomorrow, it's just ordering.) And as of right now, it's being sold at a 19% discount at Amazon. Why 19%? I have no idea, but run with it. RUN AND GET THIS BOOK AND GET IT INSIDE YOUR BRAIN. Here's some of the stuff out there people are saying about it. Also there's guest blogs from me about it, excerpts, all sorts of things. 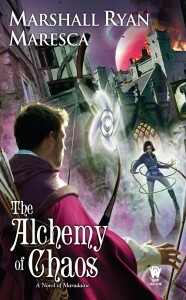 ENCHANTED ALLEY has an interview and gives it a 5-lantern review. A DREAM WITHIN A DREAM gives you an excerpt. SCI-FI CHICK has a giveaway and an guest blog on my influences. 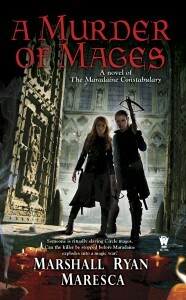 FANTASY BOOK CRITIC has a guest blog as well. It would be impossible-- and also pointless-- to cover every possible element of worldbuilding. You would have to gain a decent mastery of dozens of disciplines, including but hardly limited to geology, biology, meteorology, ecology, zoology, botany, astronomy, sociology, anthropology, architecture... the list could go on. And that's just the fundamentals. No matter what, there will be all sorts of details that will be left out. It's inevitable. And there are any number of fine-points that you'll gloss over in your worldbuid that I could address. I'm going to delve into a specific one: the history of the world. Most of the time any worldbuilder will outline the big points: the wars, the revolutions, the queens and kings, the founders and the traitors. But what about the less obvious things? What about the philosophers, the scientists, the creators? What about the people who guided the culture to where it is? In your worldbuild, ask yourself: who is the Euclid? Who is the Newton? Who is the Aristotle or Socrates? Who is the Homer or the Shakespeare or the Michelangelo? The Martin Luther or Adam Smith or daVinci? Or on a different scale: who founded the nation? What is their Magna Carta or Constitution and who wrote it? Why did they write it? Now, do you have to answer all these questions? And if you do, do the answers have to end up on the page? (No.) But I think there's a lot of value in thinking about these things, that it can add a richness to your worldbuilding that will translate to your writing. 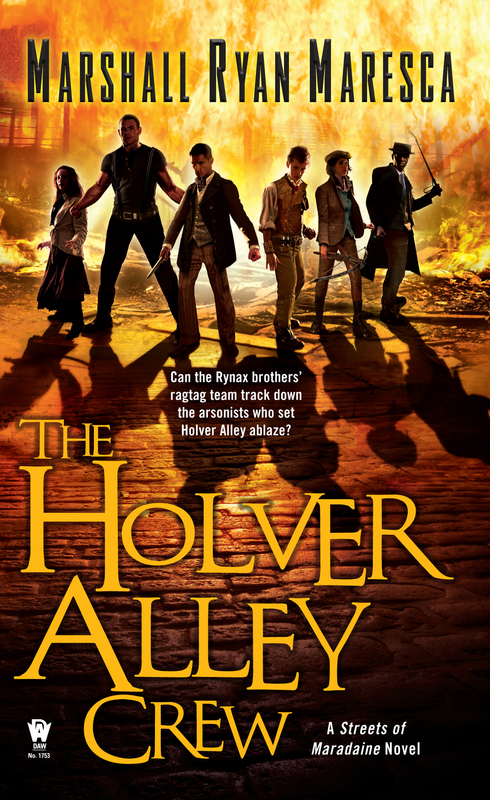 Only a few days left to pre-order Holver Alley Crew! I'm really excited about this new series.